Although as stated previously most boxes made from cylinder are more adaptable to lathe-work than hand-work, this particular design Figure 32 is not particularly difficult. The ends are two circles fret-sawed from 3/16" sheet, 3%" in diameter. The body of the box is half of a #6 cylinder, sawed in two longitudinally. All four edges thus formed are rabetted on the little device previously described, the cut being made on the inside of the two edges forming the lid, and on the outside of the two forming the bottom part of the box. The handle cemented to the center of the lid, is a piece of round or square rod of whatever shape might be on hand, and the feet are two small pieces of 1/2' black sheet, cut to the shape shown, with any variations you desire. These are cemented to the lower part of the box, in such a position that both are flush with the table when the two end-pieces are flush. The top cylinder-section is sanded so that it is slightly shorter than the bottom section, which is cemented to the end-plates, while the top piece merely fits between them loosely. The end-plates are almost 1/8" larger than the cylinder, all around. Everything should be polished before cementing, except the actual edges to be joined, and if more convenient, these can be polished at the same time, and sanded lightly afterwards, before applying the cement. (See Plte 3G). Fig. 32. The cigarette-box described in Project 24. Cigar and Cigarette-Holders These constitute favorite beginner's projects, and yield quick results with little equipment. The material cannot be used for pipe-bowls, etc., in direct contact with fire, as direct excessive heat will make it brittle, but for pipe-bits and holders it yields beautiful results. Countless methods are used, depending on the skill and equipment available. 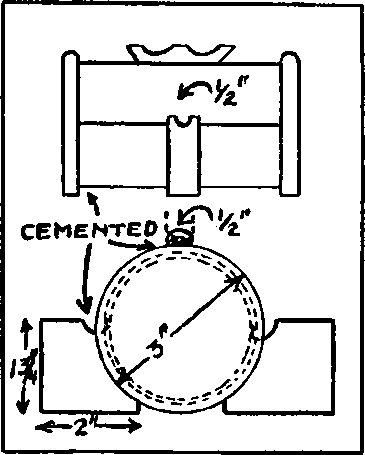 The simplest form, which requires practically no equipment, is to drill small holes in sheet scrap and any kind of scrap or small sections cut from 3/8" rod, etc., string these pieces on a greased piece of rod or heavy wire and cement them together, then sand-paper, file or otherwise shape the contour of the mass to the round, square or other shape desired, reaming out the fire-end to the proper size, and filing a little nick at the bit-end. The next step is polishing with compound and rag. Fig. 32A. Above, Various steps In reducing a piece of round rod to a, cigar-holder. 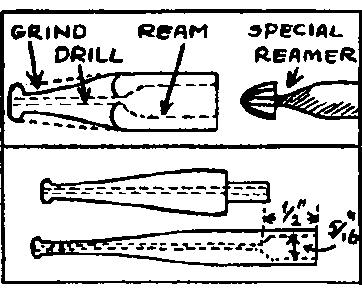 The special reamer at the right to described in the chapter on Carving, Figure 15. Below, a pipe-bit and a cigarette-holder. Where a little more equipment or a little more skill is available, full-length holes can be drilled, either with ordinary drill-bits, or with a bicycle-spoke ground fish-tail shape at the end. The next step is working with power tools, shaping on the lathe or with a grinding-wheel, and drilling with a drill-press and reaming with the special cutter described in the chapter on carving. Various types of holders are illustrated above. Going Into The Costume Jewelry Business When the art of working colored plastics in home workshops came over the horizon, it was instantly recognized as the most practical and satisfying hobby of all, and one which would most easily lend itself to commercialization by those who like to work with tools, but who like to make their work pay for itself in money. To be readily saleable, an article must compare favorably with factory-made products, in finish, design and workmanship. No material lends itself so thoroughly to this desired result as colored plastics, or cast resins, for the gorgeous finishes so quickly and easily obtained in this remarkable new material are found in the material itself, and require no skill or training to bring out, whereas the finish on all other crafts materials must be painted or lacquered on, and laboriously polished and rubbed by hand, or plated on or what-not. With plastics, a touch against a buffing-wheel brings out a brilliant mirror-like surface, with flashing colors and beautiful pattern that are unmatchable in any other medium regardless of the labor or expense involved. Designing is another simple matter, as compared with the problem of design in other materials, for in plastics, color and finish provide the main factors of appeal, and we all possess sufficient originality to do the shaping. The material comes in convenient shapes and forms which in many cases only require cutting off in slices to give us a finished article, needing only buffing and polishing. The material lends itself particularly to modern conceptions of design also, and about all the designer has to do is to juxtapose two pieces of contrasting colors to have a piece that might have been designed by the highest-paid artists in the business. The more machinery you have of course, the greater is your production, with the least labor. A fifty-dollar workshop, consisting of a wood-turning lathe, small drill-press, jig-saw, grinding' and buffing head and a bench-saw, are all that are needed to turn out several hundred dollars worth of plastic jewelry a week. The only additional equipment that could possibly be desired for quantity production would be a tumbl-ling-barrel, which can easily be constructed with this equipment. (A detailed description of the construction of a small tumbling-barrel will be found in the chapter on Finishing). How to find a market? 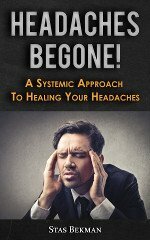 How to compete with chain-store merchandise? To the faint of heart and the unimaginative, these two points might seem a serious stumbling-block. Why work an hour over something that is a duplicate of merchandise found in the dime-store? The answer is — don't. Don't make dime-store stuff. In the first place, they can make and sell certain articles for less than the raw materials alone would cost you, because they can and do buy in ton lots. By the same token, however, they manufacture and sell in ton lots, and they seldom make less than a hundred thousand of any one design — they couldn't afford to. That is where you have the dime-stores lashed to the mast. It costs them an average of a thousand dollars for each "set-up"—it doesn't cost you a dime to change designs. They are limited to designs that can be made on automatic machinery — you have no limit to your designs. They are limited to designs and merchandise that will sell in huge quantities, to people who are willing to wear dime-store jewelry — YOU can go after the one dollar and five-dollar trade. Visit the better department stores and women's novelty shops, and study the more expensive designs, and you will understand this point clearly. Markets are easy to find. Make your wares known in the proper way, and markets will come to you. There is a certain fascination to a woman in knowing that she owns the only one of its kind, whether it be a hat, dress or carved bracelet — that is why Mrs. Gloria Vanderbilt gets a thousand dollars for a one-of-a-kind dress in her Fifth Avenue shop when that dress could probably be duplicated on Second Avenue for $8.98. Go to the best dress-shops and dress-makers, and arrange with them to offer their clients complete sets of costume jewelry to go with each expensive dress they sell, made and designed especially for that dress. Make up special sets, consisting of bracelets, pins, buckles, earings and clips in four different colors, to be worn in sets with different costumes. Get your work displayed by your local jeweler and arrange with him to take orders. Treat your trade and your products as "art" rather than as "merchandise", and you will find that people will be glad to pay for this difference. Another profilic source of business is school and club emblems. These items bring a good price and a quantity can usually be sold in one spot. They may consist of initials, monograms or school "trade-marks", jigsawed out in the school colors, backed with either a pin-back or spring-dip. Then, after gaining a little more experience in production and selling, you can go after the commercial advertising business. As one example, one of the nickel candy-ring companies is paying a high price for a quantity of cast and carved large-sized reproductions in plastics of their candy and mint rings. Another large company is doing a big business selling ash-trays consisting merely of a half-inch-wide section of bracelet cylinder with a pressed metal insert, the name of the firm being printed in gold on the edge of the plastic ring. Your own ingenuity will suggest countless advertising-novelty ideas after you get going. If you are going into the plastics business, there is no reason to limit yourself to costume jewelry, although this is the simplest type of work, and not only provides easy training in manufacture and merchandising, but serves as a good introduction to prospective dealers and customers. After learning your way about however, you should branch out into ash-trays, cigarette boxes, salt-and-peppers. (I heard of a homecrafter the other day who went to his favorite tea-room and got an order for a hundred pair of these on his first call — it put him in business) jewel-boxes, powder boxes, and on up into the more intricate realm of copying carved museum masterpieces in jade, ivory, rose-quartz, crystal and semi-precious stones. The field is unlimited, the public is willing to pay well for originality, color and workmanship, and the initial investment is small — this may be, at last, the business you are looking for as a means of turning your spare time in your workshop into money.